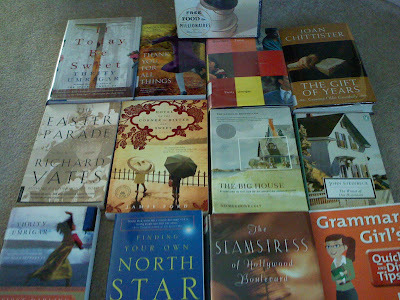 February was a very gray month around these parts: some snow, lots of rain, and many days spent at home just reading. I managed to read (14) books in February so I am pretty happy. I read lots of books that were pretty good. Through the books I read, I visited places in India and Australia. I also saw some more of the United States especially New England: Connecticut, New Hampshire, New Hampshire and Massachusetts. I also visited: California, Illinois, Wisconsin, Texas and Ohio. 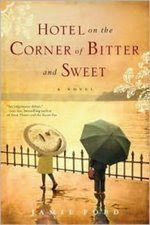 Hotel on the Corner of Bitter and Sweet: A Novel , is a "bittersweet" debut novel about Henry Lee beginning in wartime 1942. Henry is Chinese and ignored by the white students at a Seattle elementary school. One day he meets Keiko Okabe, a Japanese American girl, and the two become immediate friends since they are the only Asians in their school at that time. Henry's father makes him wear an "I am Chinese" button, which makes things even more difficult with his bully classmates in school, and also around town. His father harbors a hatred for Japan, and as a result, Henry tries to keep his friendship and love for Keiko a secret. When Keiko's family is sent to an internment camp, Henry promises to wait for her to return. Some forty years later, Henry finds a crowd gathered outside the Panama Hotel. The Hotel was once the gateway to Seattle’s Japantown. The Panama Hotel has been boarded up for decades, but now the new owner has discovered the belongings of some Japanese families that were left behind when they were sent to internment camps during World War II. Henry notices something that looks familiar when the Hotel owner opens a Japanese parasol. Henry is certain that the parasol belongs to his long lost young love, Keiko. His love for her is rekindled. The story shifts back and forth from the WWII years and 1986. Henry is now 56 years old, and a widower. He took an early retirement to care for his terminally ill wife Ethel. Also woven into the story is Henry's strained relationship with his son Marty. Marty does not know much about his father's past, but little by little he begins to piece together the puzzle of his father's past. I thought Hotel on the Corner of Bitter and Sweet: A Novel was a very good debut novel, there were parts when the story seemed to drag, but in the end I was I happy that I chose this book. A very satisfying read. This review is based on the advance reader copy I felt fortunate to have received. Struggling to build a business with the help of her fellow picture brides, Jin finds both opportunity and prejudice, but ultimately transforms herself from a naive young girl into a resourceful woman. Prospering along with her adopted city, which is fast growing from a small territorial capital to the great multicultural city it is today, Jin can never forget the people she left behind in Korea, and returns one last time to make her peace with her former life. 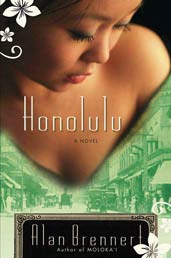 With its passionate knowledge of people and places in Hawaii far off the tourist track, Honolulu is a spellbinding story of the triumphs and sacrifices of the human spirit that is sure to become another reading group favorite. The Ghost in Love by Jonathan Carroll, was recommended to me by a friend from my book group. This author is new to me, and since I was looking for a good audio book, I decided to give this one a try. In this story we meet Ben Gould, a man who is fated to die but doesn’t. One day he slips in the snow, and hits his head on the curb. He was supposed to die but he doesn't. Ling is a ghost who was sent to tie up the loose ends in his life, but when he learns that Ben is not dead, the story turns a bit too weird for me. A ghost that cooks gourmet foods, Pilot the talking dog who can communicate with the ghost, angels, a stalker who looks like a homeless man. The story was a bit too over the top for me. In then end when I tried to sort it all out, I would have to say that this is a story about a man trying to reconcile his life. The reader was great and the story very imaginative, so I did not feel this was a total waste. The book was just not the type of story I would normally read, or would care to read in the future. 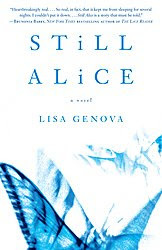 by Lisa Genova from Simon & Schuster....so many of my friends have been raving about this debut book: a heartbreaking account of a brilliant 51 year old woman stricken with early onset Alzheimer's disease. I did not want to put this book down as I was immediately drawn into the story of Alice Howland. Alice is a Harvard Professor at the height of her career, a wife, and a mother of three adult children. The signs were gradual and initially attributed to stress, her hectic life, and menopause. It began with sporadic incidents: brief memory lapses, forgetting names of things or misplacing items, but when she gets lost in her own town she begins to believe it may be something more serious like a brain tumor. When she sees a medical professional and undergoes some testing, the diagnosis shocks Alice and everyone in he life. Even more heartbreaking is the fact that there is no cure, but only various pills and vitamins that could slow the diseases progression. From her diagnosis of Alzheimer's Disease to her sad downward spiral, the reader feels every emotion as if they were Alice. At one point Alice says she wishes she was told she has cancer, for at least she could fight that with chemo and radiation. She added that even if cancer is not cured, you get a chance to say goodbye to your loved ones. Sadly with Alzheimers you don't get a chance to say goodbye at the end, because is ravishes your mind and you are unable to recognize loved ones at the end. The character of Alice is unforgettable and the story is so powerful. Although it might be a tough subject for some people to read about, it is certainly one that deserves widespread attention.Still Alice is a book is not be be missed. A touching, unforgettable novel that reads like a memoir. 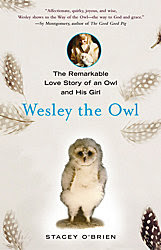 I am one animal lover who enjoys to read books about strong animal/human bonds, so naturally, I was really looking forward to: Wesley the Owl: The Remarkable Love Story of an Owl and His Girl. This was the story of a young Lab Tech who, in 1985 took a four day old, injured barn owl "under her wings". The two developed a special bond which lasted some 19 years. Since the baby owl was unable to fly long distances, it would have been unlikely that the owl could have survived on his own in the wild. The book was filled with interesting facts about owl behavior (some pretty strange as well). For example: Barn Owls mate for life, and often when the mate dies, the surviving owl often sinks into a deep depression, staring at the bark of the tree, until it eventually dies. Wesley feasted on some 28,000 mice over the course of his lifetime, and Stacey and Wesley even developed a form of communication over the years. Stacey was actually able to understand what his cries and screeching meant. This book was fairly short, and it had several very cute pictures of Wesley, but honestly, I was a little disappointed in this book --- I found the writing lacking. I had very high expectations. Somehow, I thought that this book would be more like Alex and Me; Pepperberg which was the story of a Harvard Professor and her African Gray parrot. Alex stole my heart, Wesley did not, so in comparison, this book was inferior in my opinion. If Today Be Sweet: A Novel (P.S.) is the second novel that I have read by Thrity Umrigar in 2009. The first being: The Space Between Us: A Novel (P.S.) . In this story we meet Tehmina, a recent widow from Bombay, who is visiting her only son, his American wife, and her grandson who live in the suburbs of Cleveland. Tehmina is trying to decide if she wants to move from Bombay, the place she and her husband had loved. She is torn as she also wants to be near her son and his family, but she does not want to be a burden. It would also be a big adjustment with culture change alone. Tehmina is amazed at how well her son has adjusted to life in America since he left India to attend Grad school in the US. If that is not turmoil enough for Tehimina she tries to rescue two young boys in the neighborhood, who she believes are being abused by their mother. The whole novel seems to take place in a little over a week, from just before Christmas through New Year's Eve. Tehmina must make up her mind rather quickly whether to stay in the US or to return to India as her tourist visa will expire soon. All the while she is communicating with her late husband as she is tries to decide what to do. I did enjoy this book as Umrigar's writing style again was simply beautiful. A few of the situations that took place in the story did not seem to ring true. In the end a bell seems to go off in Tehmina's head and she is able to make her decision. Helen Garner's novel, The Spare Room: A Novel , is a story about the bonds of friendship, specifically when one of those friends is dying of cancer. "First, in my spare room, I swiveled the bed onto a north-south axis. Isn't that suppose to align the sleeper with the planet's positive energy flow or something? She would think so. I made it up nicely with a fresh fitted sheet, the pale pink one, since she had a famous feel for color, and pink is flattering even to skin that has turned yellowish?" Nicola is to begin alternative treatment for her bowel cancer after both chemotherapy and radiation have not been successful in shrinking her tumor. However the place she is being treated, The Theodore Institute's practices seem to be a bit flaky to say the least: organic coffee enemas and vitamin C infusion therapy to name a few. All the while Nicola's pain is increasing and although Helen tries to support her friend, in her mind it is clear this quack-therapy is not helping. Nicola swears the reason for the pain is because the treatment is working and that the toxins are leaving her body. This story is a fascinating look at friendship when one friend is clearly at deaths door. The dying friend searching for that miracle cure at any cost, and the other friend believing that the final days should be spent enjoying time with family and friends and not on foolish treatments that are not helping. I felt much of this story was more about Helen and the issues she was faced with regarding her own mortality, as she watched a dear friend slipping away.The Spare Room: A Novel , just 175 pages; is not perfect, but it was well done and is recommended. 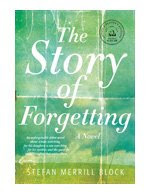 The Story of Forgetting: A Novel is an amazing debut novel. The story is about a family that is genetically predisposed to early onset Alzheimer's disease. The story alternates from Abel, and elderly hunchback who lives somewhat as a recluse on the family farm which surrounds a suburban neighborhood. We also hear the story of Abel's early life including the fact that he had fallen in love with his brother Paul's wife. Then some 100 miles away in Austin, Texas we are introduced to Seth Waller. Seth is a skinny - pimpled teenager who just does not seem to fit in with other kids his age. When Seth's mother is diagnosed with Alzheimer's Disease at an early age, he is determined to find the genetic root of this illness within his family which seems to be tied to a specific gene: EOA23. Although these Abel and Seth do not know each other initially, they each have close family members who have been stricken with the same disease. Also woven into this novel is a story of a fantasy place called Isadora, a land where memory is never possessed, so it can never be lost. This book is best read slowly; the writing is beautiful, and the story is very touching as well. I will be looking for more books by this talented young writer. Mark Bittman is author of : How to Cook Everything and How to Cook Everything Vegetarian. 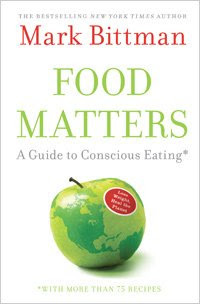 His latest book: Food Matters: A Guide to Conscious Eating with More Than 75 Recipes , outlines a plan for responsible eating that's good for you and for the planet. I thought this book was pretty interesting. Although a lot of the information was not new to me, I found it interesting the way Mark Bittman tries to demonstrate that by being more aware of the foods we are buying and eating is not only better for us, but better for the environment as well. The typical American diet, has way too much meat, refined carbohydrates, and junk food, leading to both health problems such as : heart disease, obesity, diabetes. As a solution, the author argues for changing the way we eat and buy food. Specifically, he wants us to eat less meat and junk food and more vegetables and whole grains. America's high meat consumption, in terms of the energy required to raise livestock and ship meat all over the country, contributes to global warming. For example, in terms of energy consumption, serving a typical family of four steak dinner is the rough equivalent of driving around in an SUV for three hours while leaving all the lights on at home. Simple put, by making some of the diet changes outlined in the book, such as eating more fruits, veggies and whole grains, we will not only shrink our waistline, but also help the environment as well. The author mentioned that when he made these changes to his diet (reducing his meat intake by 70%), he also lost 35 lbs. The book included about 75 recipes, many of which looked great. In addition there were sample menus and tips for stocking your kitchen with new healthy foods. If you are looking for a good book on healthy eating, give Food Matters: A Guide to Conscious Eating with More Than 75 Recipes a try. Jessica Ford is a young lawyer trying to rise in a powerful Washington, D.C., law firm. Her life gets thrown for a loop when she gets into a car accident that kills the first lady. Jessica wakes in the hospital to find someone trying to kill her as well-tipping her off that the crash wasn't just an accident and she never should have survived it. In steps Secret Service agent Mark Ryan, the head of the first lady's security detail. As bodies start piling up around Jessica, she and Mark have no one to turn to except each other, and as the conspiracy begins to point to some very high places, the duo begin to realize the key to saving their lives is locked away in Jessica's memories. 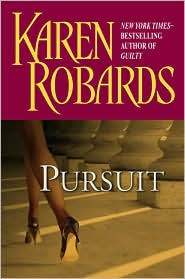 Jessica and Mark make a superb team, and even if their romance feels tacked on and the big twist contrived, Robards's fans will enjoy this fast-paced and action-packed romantic thriller. "I never found a good way to fill all the silence. In the months that followed the great tragedy of my life, I sprang from my bed every morning, donned my five-pound, cork-soled boots and did a high-step from room to room, colliding with whatever I could". What a great little (224 pp) gem of a book this is. There is even a Grammar Girl Website , which is pretty cool as well. Are you stumped by split infinitives? Terrified of using “who” when a “whom” is called for? Do you avoid the words “lay” and “lie” altogether? Mignon Fogarty, a.k.a. Grammar Girl, is determined to wipe out bad grammar—but she’s also determined to make the process as painless as possible. One year ago, she created a weekly podcast to tackle some of the most common mistakes people make while communicating. The podcasts have now been downloaded more than seven million times, and Mignon has dispensed grammar tips on Oprah and appeared on the pages of The New York Times, The Wall Street Journal, and USA Today. (p.77) Don't start a sentence with the word: Hopefully. For example: Hopefully, it won't rain. According to this book, "For some reason too many language sticklers say starting a sentence with Hopefully has become a mark of ignorance." GUILTY-- Shame on Me. (p.83) Don't start a sentence with: However, Hopefully, A Conjunction, Because, or a number. ie: means in other words ; eg: means for example - it is not either or. Lay - putting down an object - "lay down a pencil"
Note: Eric Clapton's song "Lay Down Sally" is grammatically incorrect. It should be "Lie Down Sally". Thought that was pretty funny. The Seamstress of Hollywood Boulevard: A Novel was a great historical novel based on the life of the author’s grandmother. From the book...."I couldn't cook, but I could sew. It would have been better the other way around." At the turn of the 20th century, Nell is just a young teenager when she marries a rancher, moves in with her in-laws and soon after has two little girls –all within a couple of years. Nell is depressed and unhappy with her life in Kansas, but she has no one to share her feelings with. She convinces her husband to let her have a sewing machine, so she can have a creative outlet. She finds that she has real talent, and she begins to earn some money sewing beautiful dresses for wealthy women in the area. She quickly finds sewing is her passion, not cooking, cleaning, and mothering her daughters. She puts the money she earns from sewing dresses away, and dreams about a different and more exciting life. Before long her mother-in-law begins to interfere, and her husband begins to criticize her mothering skills. Nell is infuriated when Jack also sells her sewing machine. So much so that she leaves her husband, young daughters, and the mother-in-law in Kansas and heads for California. In California Nell begins a new life. She works as a shop girl and soon begins sewing again for wealthy clients, and then for the motion picture industry. Nell remarries and she neglects to tell her new husband about her past. She even has another child. Nell can run, but she cannot hide, soon her past catches up with her. I enjoyed the character of Nell very much, and it was interesting reading about Hollywood in the early 20th century. I did have a bit of a problem with the ending as I think it seemed unrealistic given the time when this novel was to have taken place. I won't elaborate as I do not want to give away the ending. All in all The Seamstress of Hollywood Boulevard: A Novel was still an enjoyable read. I fell in love with Sandra Kring's first book: The Book of Bright Ideas last month. In fact, I loved it so much, I followed it up with her second book, Carry Me Home which I also enjoyed. Her third and most recent book, Thank You For All Things was also a hit with me. This story has an eleven year old narrator who was great; her name is Lucy McGowan. Lucy and her brother Milo are twins. They are both gifted with genius level IQs, although brother Milo has Lucy beat by 30+ points. Milo is nerdy and always has his nose in a book or is working on complex mathematical formulas, while Lucy is extremely intuitive. At age eleven she already knows she wants to be a psychologist when she grows up. Tess, their single mom, their grandmother Lucille, and the twins leave Chicago for Timber Falls, Wisconsin, to care for Tess' father who is dying. Tess is dealing with unresolved conflicts, carrying her own baggage from her childhood. The father was an abusive man who failed at marriage and fatherhood. Lucy believes her visit to Wisconsin will help her to found out who her father was. She is very curious, and she goes to work with her investigation. By reading her mothers old journal entries, she hopes to solve some mysteries about her families past. What Lucy finds is a bit more than she bargained for. The family dynamics in this book were great, and all of the characters were so well developed. While her first book The Book of Bright Ideas is still my absolute favorite, this one was still great. Sandra Kring will be added to my list of favorite authors, and I will be looking forward to more books by this talented author. About four years ago I read a strange little book by Paul Auster called: Oracle Night, and only now have I realized my second Auster book: Travels in the Scriptorium, was the same kind of strange book. 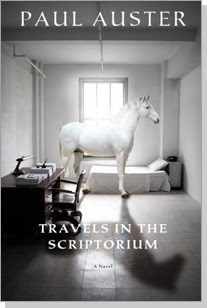 The cover (all black and white) is what drew me to this book: a stark white room with one window, a white horse and a desk and chair. We are introduced to an older man who wakes up in this stark room; he is known as Mr. Blank. He does not seem to remember how he arrived to this room or how long he has been there. He begins to think that maybe he has always been there but just can't recall any details. One thing that he does seem to know for sure is that he is feeling very guilty about something, but he also feels that he is a victim of some type of injustice. An overhead camera in the room is recording his every move; a microphone records his every sound; he is being watched --by who and why? A woman named Anna comes to help him with his personal care. He senses something deeper about her, that she really cares about him. He finds a manuscript on the desk that he begins to read, it is the story of a prisoner in a place foreign to Mr. Blank. He senses that this manuscript was left for him for some reason--but why? Various people come to visit who seem somewhat familiar to him; some people bring meds for him to take, and each person bring clues to who Mr. Blank is but, he remains frustrated and in the dark about his past. When the manuscript he is reading comes to a standstill his doctor suggests that he come up with an ending for it. Mr. Blank.....white room.....Blank paper......Writers Block.....Scriptorium>> I get it. I must say, this will be my last Paul Auster read. This story style is just not for me. The unabridged audio edition was just four discs; the reader was fine, the story was just too bizarre. I'm not sure which books will get returned unread at this point, but I am enjoying Thank You for All Things; Kring right now. 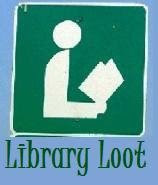 Did you find anything that looks good at the Library this week? Post your link. 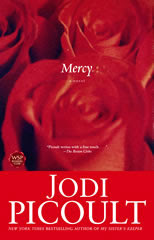 Jodi Picoult is one of my favorite authors and Mercy was the only book of hers that I had not read, so it went to the top of my TBR list for 2009. The primary characters in this book are Carmeron McDonald, a police chief in a small town in MA; his wife Allie who runs a flower shop. Jamie McDonald (Cam's cousin) who killed his terminally ill wife as an act of "Mercy", and then there is Mia, who is new in town, and soon begins helping out in the flower shop with Allie. There are two stories with a central theme going on in Mercy, both involve the power of love. One story involves a Mercy killing, followed by a heated murder trial. The other story had to do with betrayals in a marriage. This story had a lot of potential, but I felt a little disappointed once I finished the book. For me, this story did not compare to come of her other books, my favorites being: My Sister's Keeper, The Pact, and Nineteen Minutes. 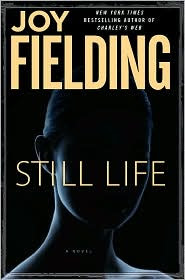 I've always been pleased with Joy Fielding's suspense thrillers ---always lots of good twists and turns to keep the reader guessing. What book looks good to you? Feel free to leave a link. Still Alice - Lisa Genova - about a Harvard Professor that develops Alzheimer's Disease in her 50's. Gringos in Paradise; Barry Golson - an American couple who builds their retirement home in a seaside village in Mexico. Has anyone read these? If so, what did you think? The bad news: this book in my opinion, it pure nonsense! The good news: I only paid $1.00 for it at a book sale. I will say that both the book and the dvd were very well marketed, and even promoted by OPRAH. To me, it appears that Byrne did not even write the book, but merely edited it. She quotes from over 20 different modern day teachers who have supposedly achieved wealth and happiness. What is The Secret? Rhonda Byrne says that it is The Law of Attraction ---whatever is going on in your mind--- if the thoughts are positive, those thoughts will be like a magnet that will pull everything good to you. Want more money, find the perfect mate, have a new house, new car, or huge raise: ask for it, believe you're going to get, and you'll get it --yeah right! You can create your own perfect health and eternal youth --what about genetics? Conversely, all bad things happen because you dwell on the thought too much. 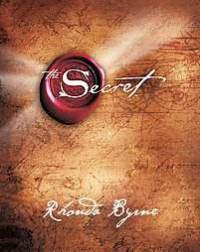 According to Byrne - we get in life what we think about, because our mind sends messages to the Universe. So is that how some children fall victim to abuse? They thought about it too much, or is that why some people get cancer? They thought about it too much? How crazy is that? If all we had to do was ASK for a cure for cancer BELIEVE it would happen and then RECEIVE it, doesn't it seem like many many people would have been miraculously cured, and we would hear about it. Sadly, there are no magic answers to why some things happen in life. "Wishing doesn't make it so", and if you wished for something and it did not happen, then the author tells us it's because we really did not BELIEVE it would happen! Very disappointing. Save your money, and borrow this book from the library if you still want to read it. 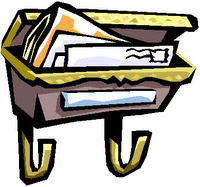 What's on your list for February?